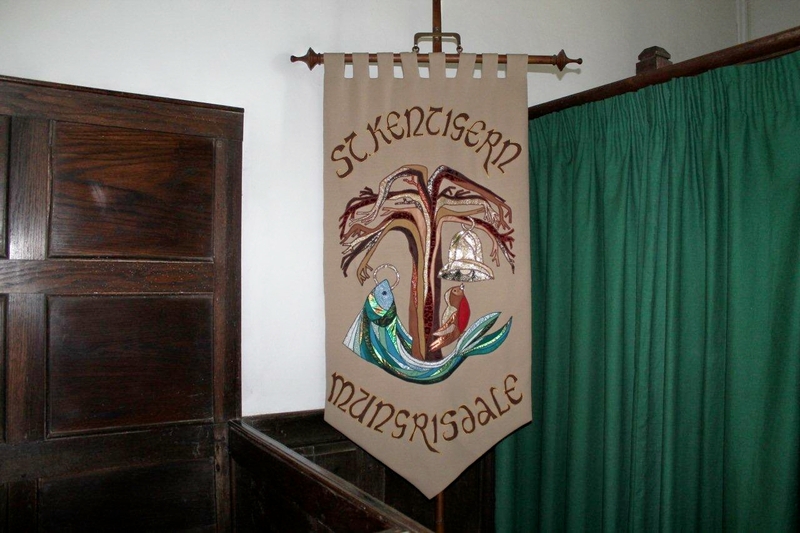 MUNGRISEDALE is a village where curtains twitch. Eyes watch your every movement from behind rhododendrons and clipped hedges. Security cameras are positioned above cottage doorways. And the parish council charges visitors £2 to park their cars on a tiny patch of land at the start of the Glendermackin track. Other than that, it’s quite a nice place . 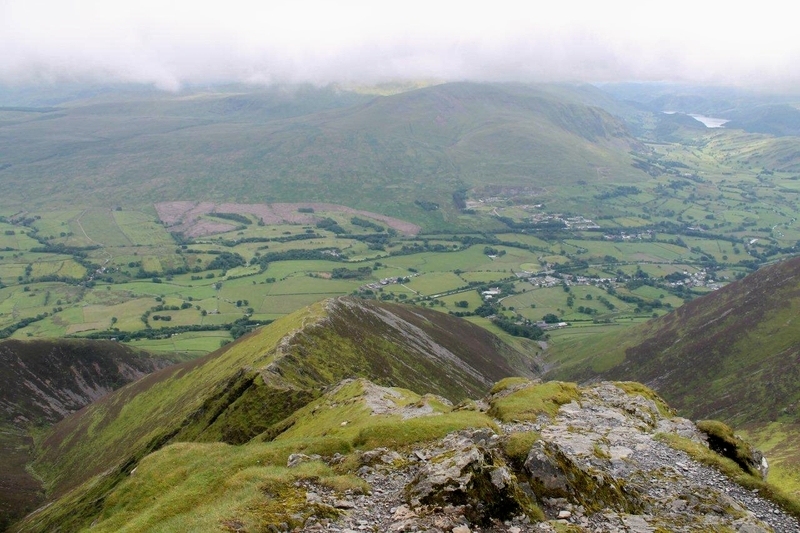 . .
Mungrisedale is also a fine starting point for climbing Blencathra by its nether side. And that’s the plan for today. 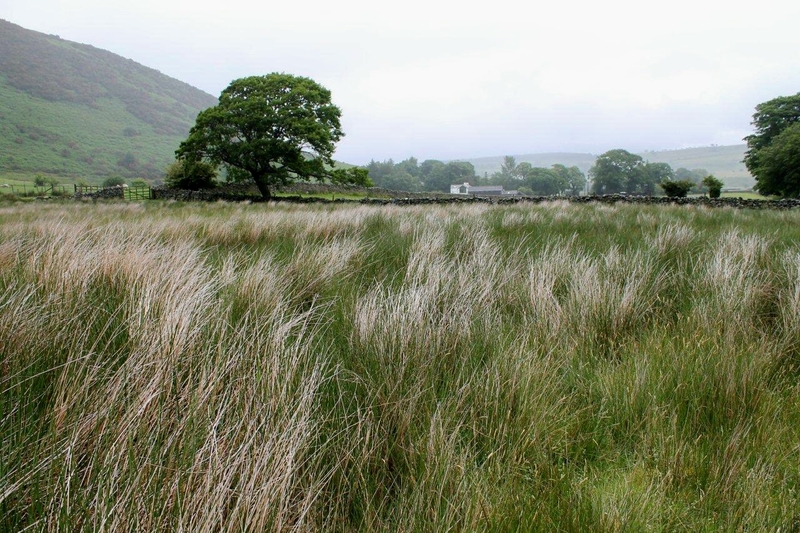 Only the plan has altered, for despite the July sun beaming its rays on the British isles in a very un-British heatwave, the Lake District fells are shrouded in a drizzly mist of the type that soaks you unexpectedly. First though, let me tell you about Mungrisedale. 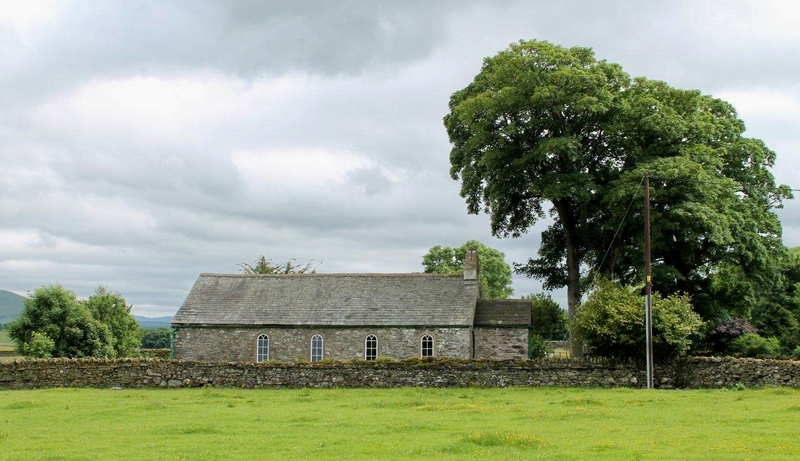 The village takes its name from St Mungo, a singer famed for his black curly hair and sideburns. Only joking. 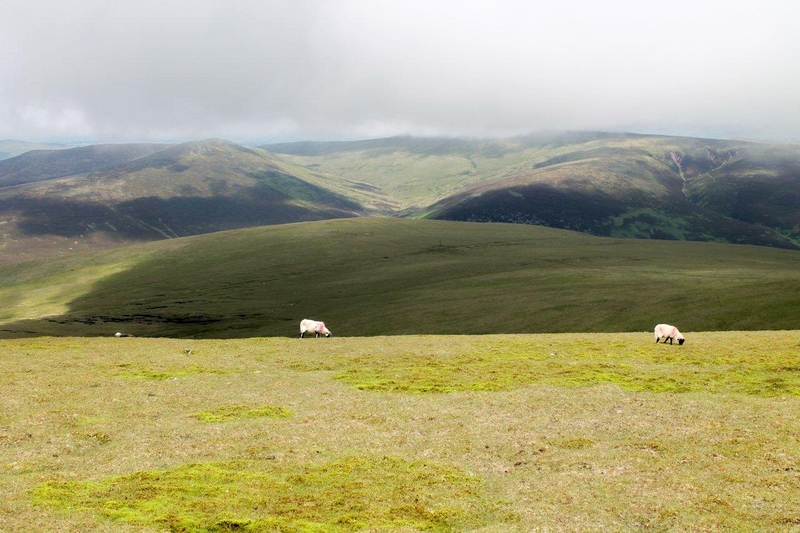 The name Mungo was a nickname for Kentigern, a 6th Century saint and son of Owain ap Urien, heir to the kingdom of Rheged – a country that stretched from the Lake District up into Galloway and Stratchclyde. 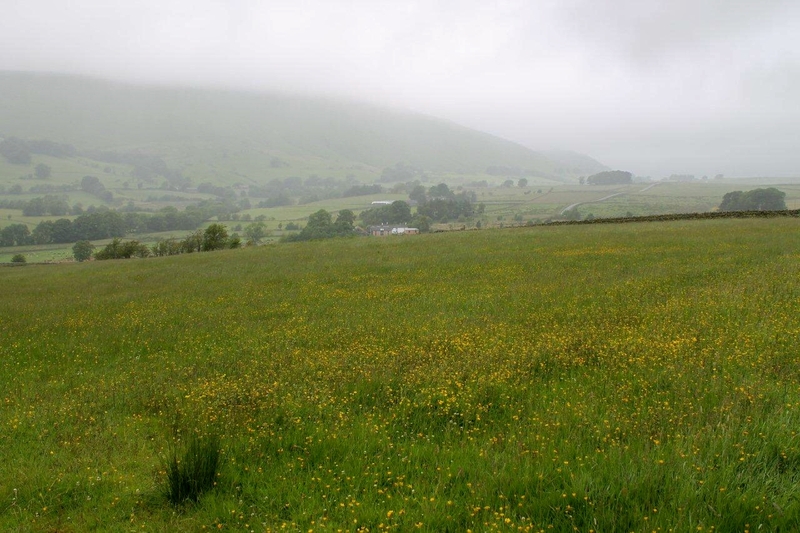 Mungrisedale translates loosely into modern English as Mungo’s valley of the pigs. It has an interesting past that teeters on the edge of Arthurian legend. PLEASE DON’T PARK HERE AGAIN. YOUR CAR IS SPOILING OUR VIEW. Today I park on the stony patch where the parish council has optimistically positioned an honesty box, and a traditional red telephone kiosk and a misplaced traffic cone vie for the remaining space. Because I’m a decent chap, I drop two shiny pound coins in the box. I might have owned a long line of cheap and shabby cars in my time, but I believe in paying my way. I also believe that health and happiness come from within, and that any person who spends their life fretting that someone’s going to park a car on a public highway a few yards beyond the foot of their extensive lawn, and briefly mar their view of distant hills they probably don’t know the names of, is a person heading for a lonely, bitter and early exit. Anyway, that incident was ten years ago. Not that I’m one to bear a grudge. 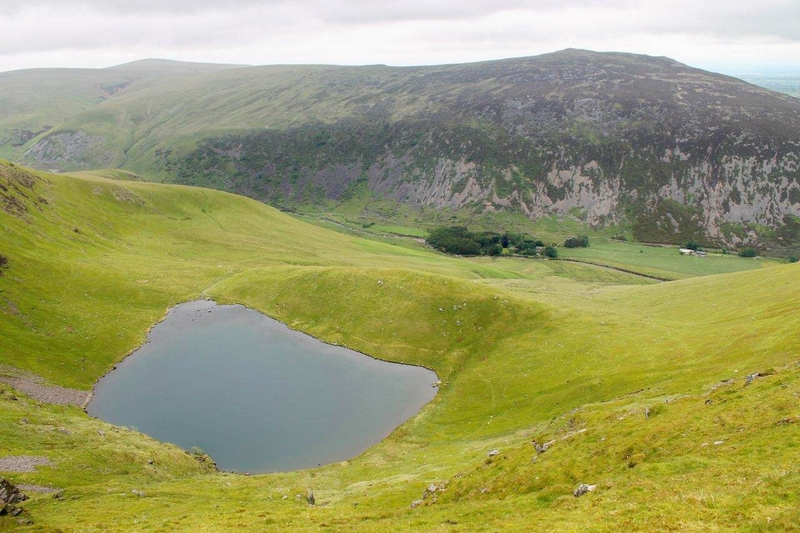 I head up Glendermackin along an old lead mine track in warm drizzle and climb to Scales Tarn, which is so deeply embedded within the folds of Blencathra that, according to legend, the sun does not glance upon its waters – but you can see the stars reflected on its surface at midday. I don’t believe that for a minute. 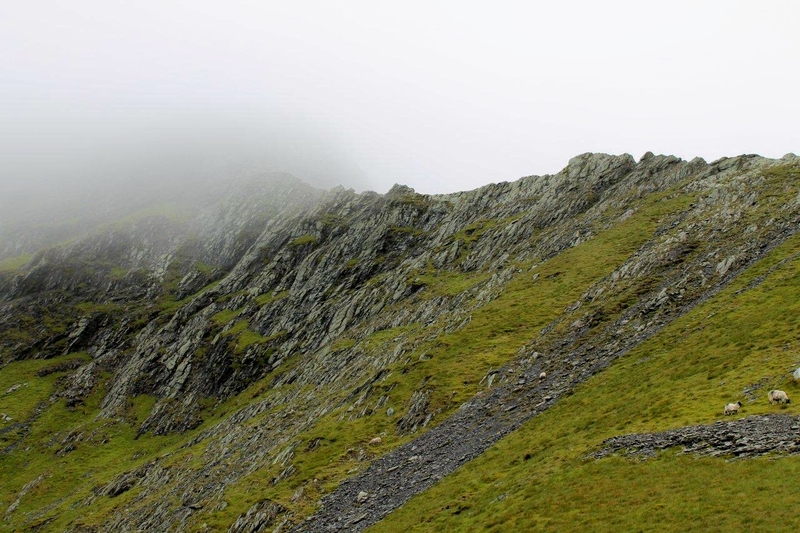 My intention was to traverse the rocky arête of Sharp Edge to the summit, but having been caught out up there before in mist and drizzle – and snow and ice – I know that today its angled slabs will be lethally greasy. 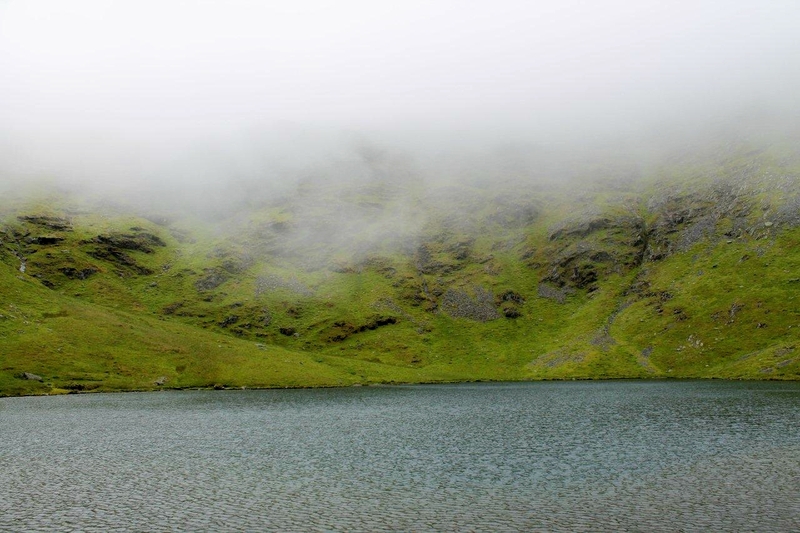 So I take the path that skirts Tarn Crags and have lunch on the summit as the mist clears. Cheese and green tomato chutney sandwiches, if anyone’s interested. Oh, and here’s another grumble. Have all television presenters been instructed to pronounce the word sandwich “sam-widge”? Am I the only person who becomes extremely animated when this occurs? Has anyone else sent a letter of complaint to the BBC written on cheap paper? You must have. I can’t be the only one. 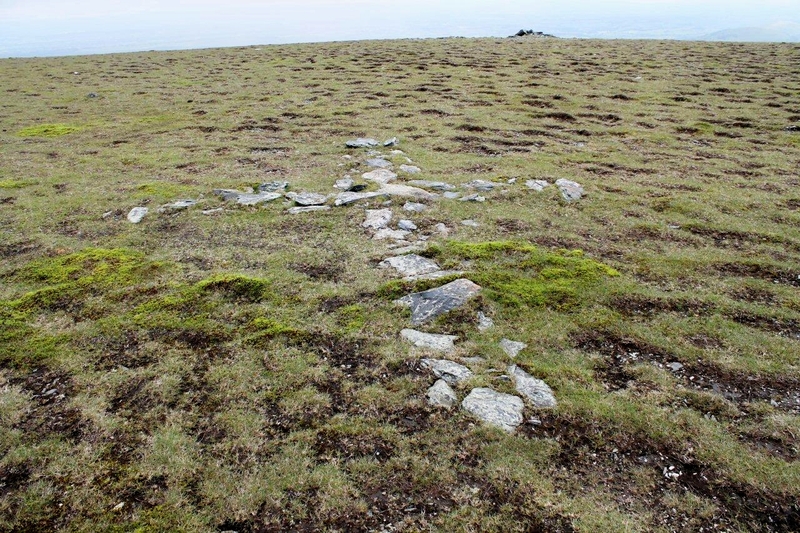 I leave the summit and pass stone crosses laid in turf. 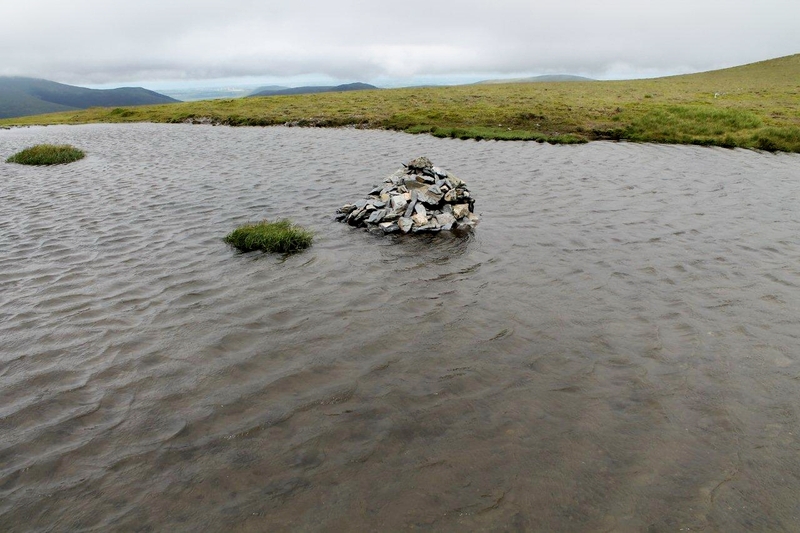 I also pass a large puddle with a cairn in its midst which looks like it should have a sword sticking out of it. I plod over Atkinson Pike, drop down to a col and ascend Bannerdale Crags, then stride out to the summit of Bowscale Fell, have an uncomfortable snooze in a rough stone shelter and wake up with cramp down the insides of both legs. This causes me to limp about in circles for some considerable time. Should have put salt on my samwidges. There’s a lesson learned. 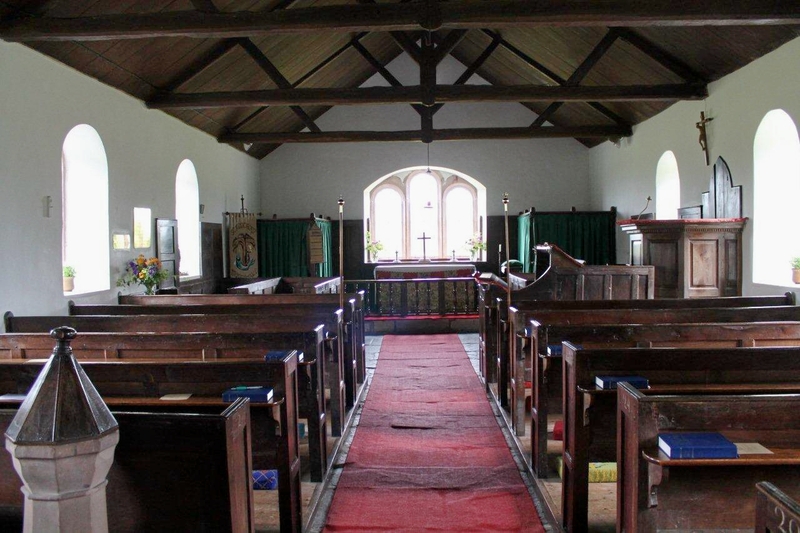 But after descending an extremely steep slope to a path above the River Caldew, and passing another cottage with a security camera positioned above its front door, I reach St Kentigern’s Church in sultry afternoon sunshine and discover peace and healing silence beneath its knotted rafters. Mungrisedale eh? 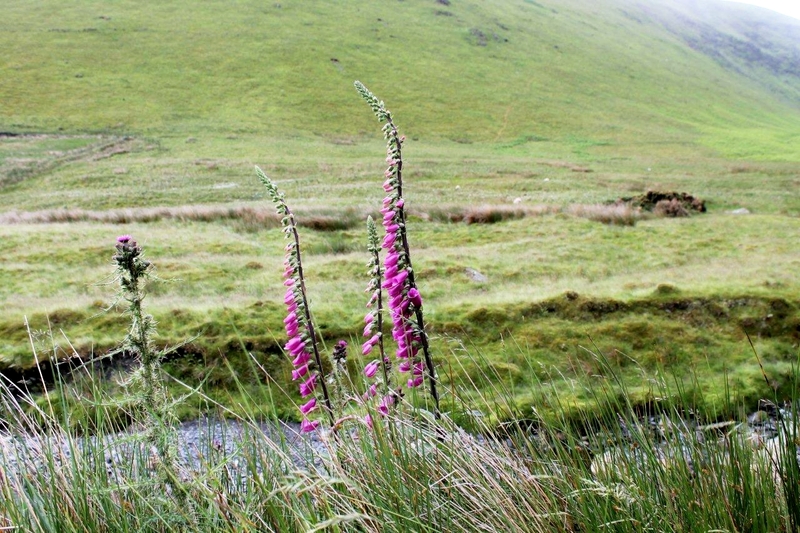 St Mungo’s valley of the pigs. I seem to have developed a love-hate relationship with the place. I wonder what it was like in Mungo’s day? In the summertime when the weather was high. When you could stretch right up and touch the sky . . . In the summertime . . .
THREE days after I climbed Blencathra, Wigan wanderer Paul Sharkey breezed effortlessly up Sharp Edge in brilliant sunshine and posted this on his Sharkey’s Dream website. Take a look. 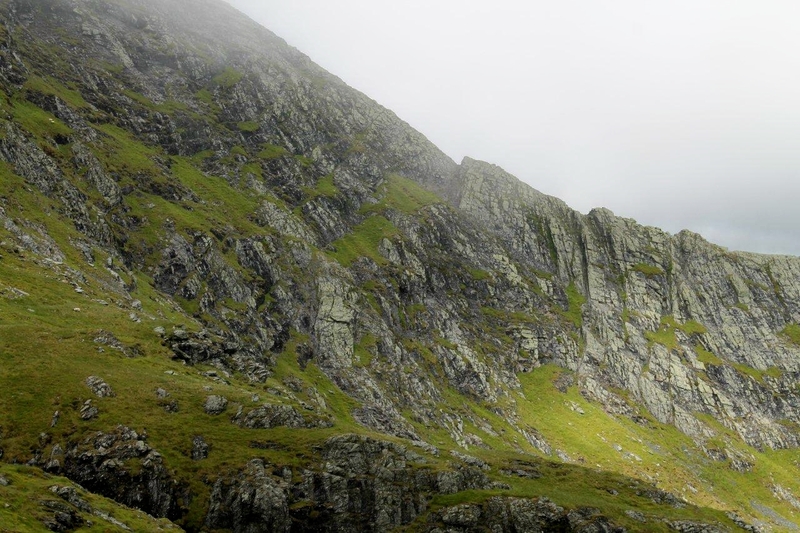 This entry was posted in Climbing, Hiking, History, King Arthur, Legends, Mountains, Music, Ranting, Religion, Walking and tagged Lake District, outdoors, Pennines, The Lakes. Bookmark the permalink. Liking this very much, Alen. Hi Mike. Thanks for that. I’ve just been looking at your website and cycling books. They are right up my street so I shall have to acquaint myself with them. I was sorry to hear of the unpleasantness in those early days in Mungrisdale, Its a village I am especially fond off not having yet met the locals as of yet. 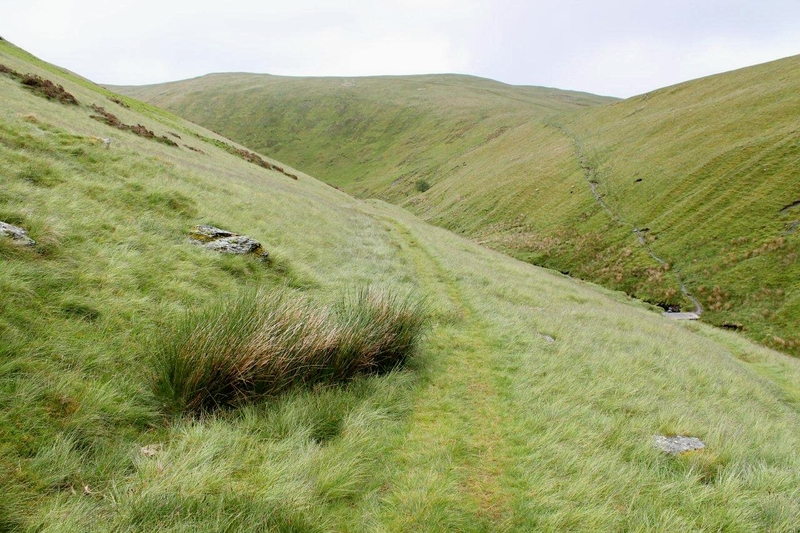 Its odd how you can attach a great walk to a place you left your car…Mungrisdale & Braithwaite both do this for me…maybe its all in the head I cant quite tell. A 1989 Peugeot 309…now they bring back great memories as I started working for Peugeot one year later which then lasted 22yrs, they don’t make em like they used too I can vouch for that! Hi Paul. Thought you might drop by. I’ve never done a walk from Braithwaite so I’ll have to look into that. It’d make a change to drive down that way. Yes, the Peugeot 309 was a good car and I had it a few years. Can’t think why I got rid of it now because it was pretty reliable. Ah, the good old days . . . It seems to be a gorgeous hike. It’s always great to be hiking when the sun is shining, but I like your pictures, Alen where the mist has a hard time to get rid of the mountain top. Hej Hanna. Yes, we have sunshine over here as well sometimes. In fact, it has been too hot these past few days. I’m sitting in the office at work now, at 9.15pm, and all the fans are on and the windows open, but it’s still too hot to work. I very nearly used picture 11 as the main picture at the top of the post. I wish I had now, but there you go. Another great post. I haven’t been up Blencathra. Am off to the Lakes tomorrow for a wild camp somewhere above Ullswater. 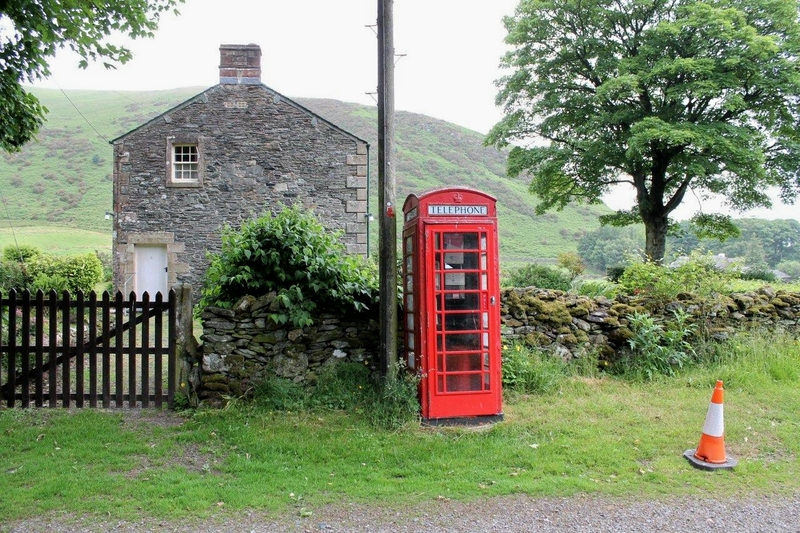 The parking story reminds me of the last time I was in Kettlewell. A lot of the of the houses there have small laminated notices fixed to the gate or fence saying “Parking by invitation only” even though they are situated on a public road! Hi Chris. I like the Kettlewell story. I cycled through there one cold and windy day a couple of years ago and don’t remember much about the place except buying a ham and mustard sandwich in the shop. If I ever return I’ll keep an eye open for the signs. 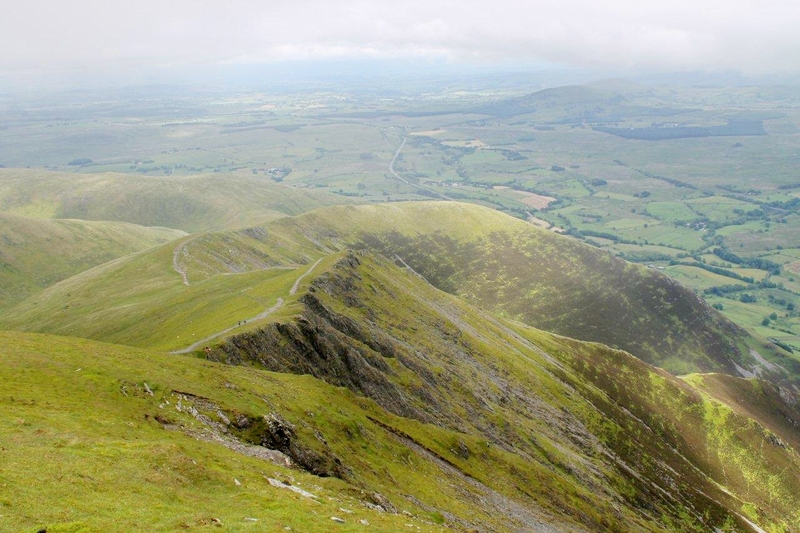 My own memory of Blencathra is the stupefyingly boring route up the southern flank, finally getting to the summit after a lifetime’s drudgery and having to come straight back down again because of lightning. Lunch, dinner. Tomato, tomayto. I like the green car idea. It opens up all sorts of possibilities, like buying one of those camouflage nets they throw over tanks to hide them. If we all did that it’d tidy up the countryside in no time. I’ve never climbed the southern flank of Blencathra from the A66 side but I’ve been up from Souther Fell, again starting at Mungrisedale. That’s not a bad walk. The lightning sounds scary, though, Chris. Are turnips turnips, or are they swedes? Turnips and swedes are completely different aren’t they? Turnips are what I put in stews and they’re sort of white and fairly bland but make it more filling – I thought swedes were kind of bright yellow? I’m no gastronome though so I’m not sure! Ah. It’s one of those lunch-dinner, dinner-lunch things depending on where you live. I would call a swede a turnip. But I’m not claiming to be an authority. And now I’m off to make my sam-widges to take to work . . . Despite seeing it most weeks I have still not climbed Blencathra. A lovely mountain, almost artistic in its beauty. Hi John. 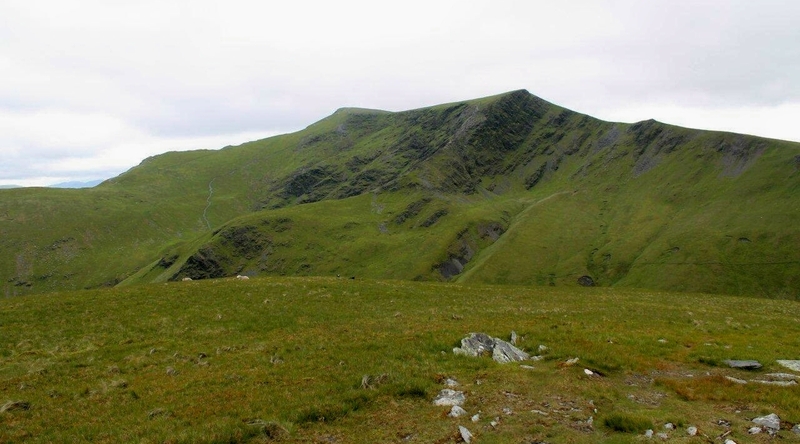 Blencathra is a fine mountain, almost symmetrical when viewed from the south. It’s always been a favourite of mine. 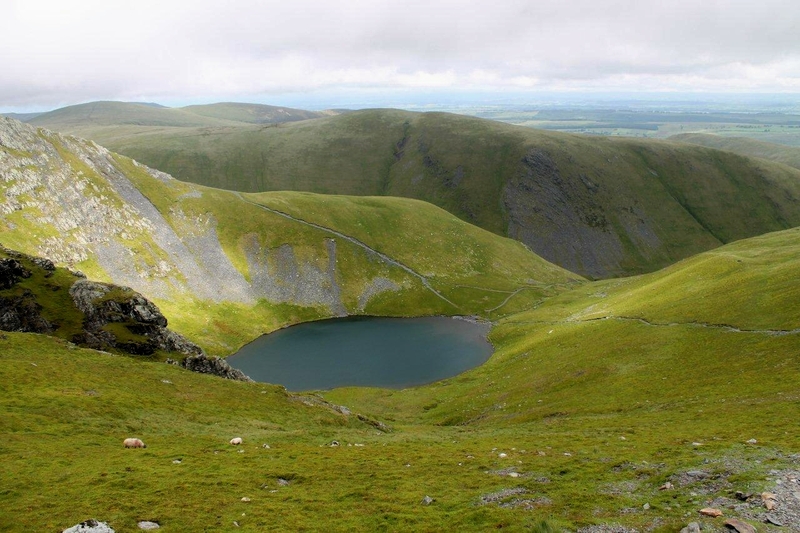 I love the idea of seeing stars in a tarn at midday! Please don’t say it isn’t true! 🙂 And what are those stone crosses all about? 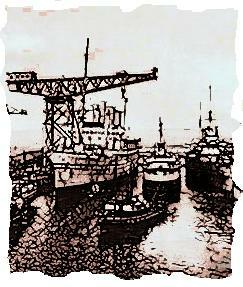 Mungo’s history is interesting – I didn’t know this was another name for Kentigern. What beautiful landscapes and I love the church as well. Mungrisedale sounds like a village with strong mining connections, not twitchy people with fancy net curtains! I hadn’t noticed the BBC’s obsession with ‘samwidges’ but I will happily add this to my little file of ‘crimes against English’ – I don’t think I’ll ever be asked for it in an investigation, but it keeps me from stropping! Another great post, by the way. The surface of that sable tarn. Sit Walter Scott getting all poetic about Blencathra in his Bridal of Triermain. So it must be true, Jo . . .
And the crosses are a bit of a mystery, Jo. I read somewhere that the white one was built by a chap from Threlkeld who used to climb up there a lot, but I’m not sure. And Mungrisedale was the nearest village to Carrock Mine, Britain’s only wolfram mine, which closed down in the 1980s, so the mining associations would have been quite strong, probably stretching back into the mid-19th Century. Ee how things change. Interesting! I wonder why they were put there. Yes, how things change – not always for the better, sadly! What I don’t like to see is the character of these lovely little villages being lost. 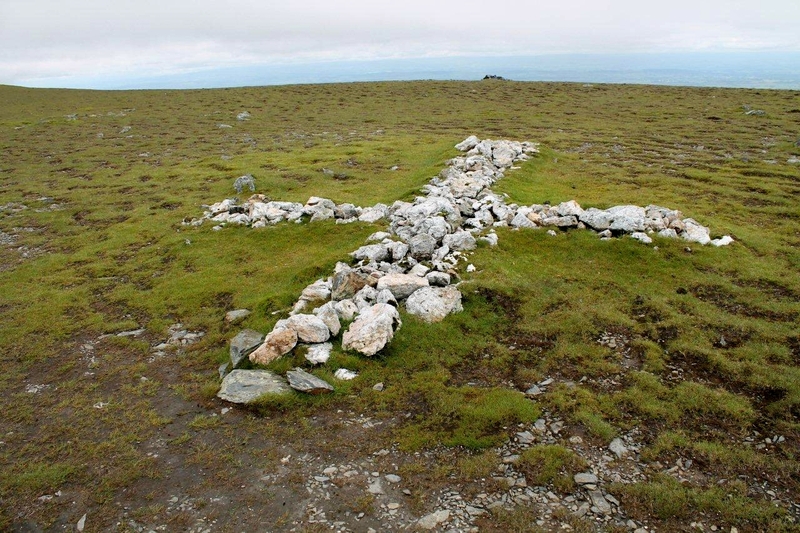 Yes, I was also wondering about the stone crosses. Intriguing! Damn. I knew I should have done some research into this. I remember Munro Jerry – what an odd-looking bloke (although i assume Mungo Jerry was really the group name and not just his). They were funny songs too – I sometimes sing them when I’m being silly. Hiya Carol. I can’t remember what I did with the note. I would like to think I tore it up rather dramatically for all to see and scattered it on the grass. I laughed at the mooning suggestion. Sounds a good idea but I would probably have been arrested and found myself on the front of the News and Star. That’s the sort of thing that happens these days. Looks like a belter! 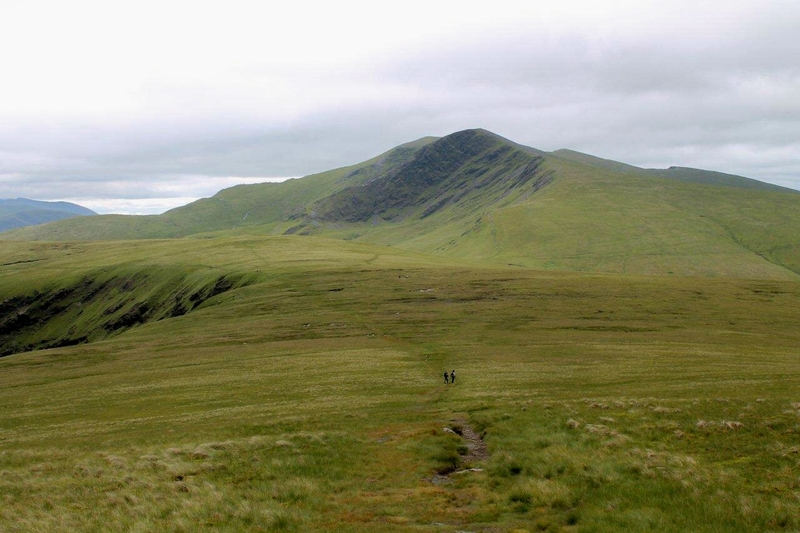 I like Blencathra and Scales Tarn and Green tomato chutney, so you’ve ticked all the boxes there….My missus gets apoplectic about the sandwich/samidge thing………I just go for sarnie myself…..
Hi Howellsey. Great, I like ticking boxes. That’s what it’s all about. And I think in future I’ll go for the sarnie option. Hi David. Your house sounds like our house. I had a rant this lunchtime – sorry, dinner time – over a non-story on the BBC 24-hour news. It was billed in the headlines along the lines of “Queen impatient over royal baby”. But when they got into the story, all that had happened was a little schoolgirl had asked her if she was looking forward to the birth, and the Queen said yes, but I wish it would hurry up because I’m going on holiday. That is not a news story. It is not impatience. It’s an old woman humouring a little girl. Three minutes of our lives was wasted. 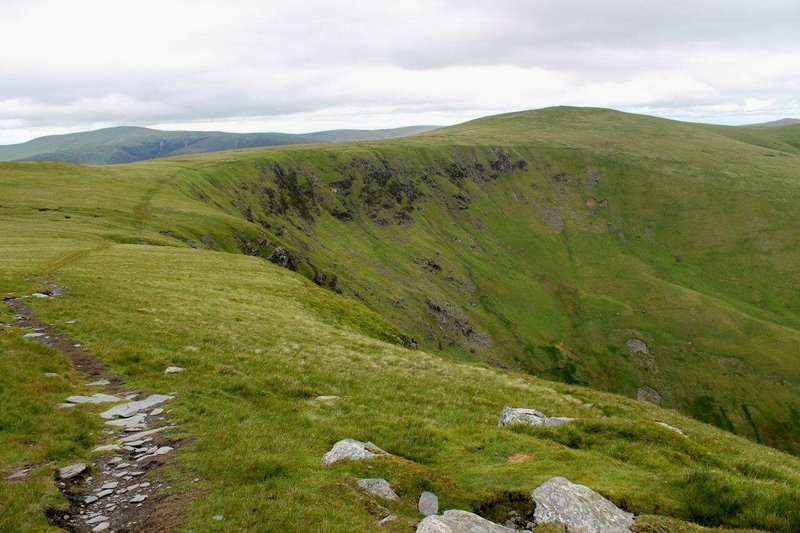 An interesting way up Blencathra Alen and one that looks much better than the usual flog up from the south. I`m now completely refreshed after a clean break from pc`s for a few months so look forward to catching up on everything. Blimey, Alex. I thought you must have gone off to live in the mountains somewhere. Good to hear from you. Hope you’ve starting posting things again. I have just come across this one and don’t know how I missed it. But I do enjoy your blog and often come back to it. This reminds me of a time I did ‘Sharp Edge’ with a mate on Boxing Day many years ago. We were both bachelors then and decided to spend Christmas in a pub in Keswick and booked 2 single rooms. After a day and night of heavy drinking we got to bed about 4 am, and were woken at 8 for a greasy breakfast which neither of us ate. 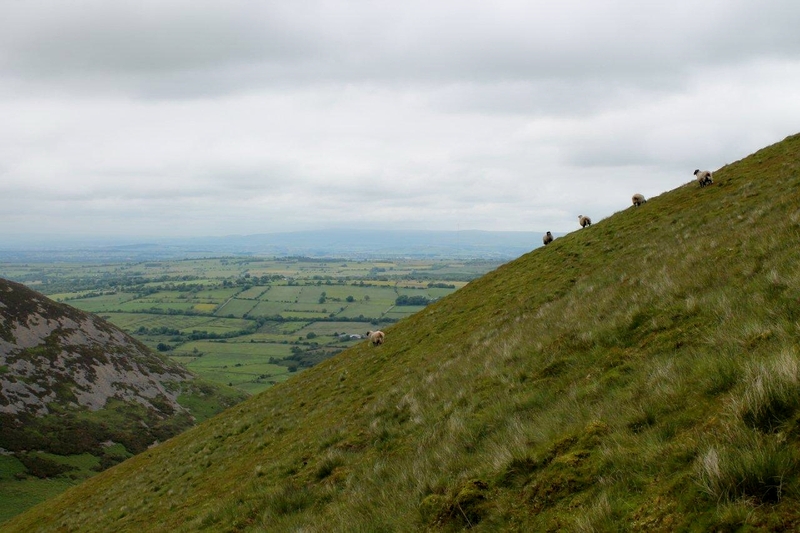 We decided to go for a walk and ended up on Blencathra (we didn’t have any proper walking gear with us or map – my mate had on a pair of pumps and a windcheater and me a sweater), and we ended up doing Sharp Edge. I don’t remember it being particularly difficult or scary and it wasn’t until quite some time later did I learn of it’s reputation. But we were probably still pissed 🙂 Very irresponsible I know, but at the time we just thought nothing about it. That’s the second comment I’ve received today that would make a decent plot for a television play. Thanks for that, James. 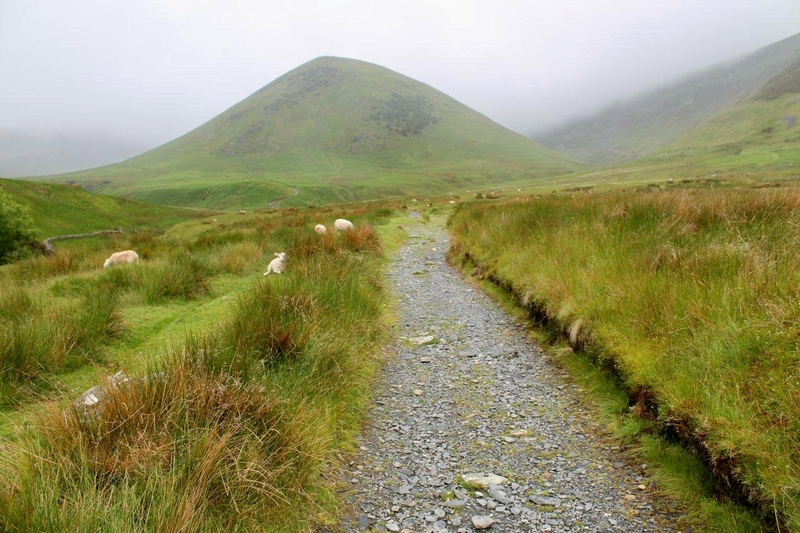 I can’t equal that, but a mate and I (when we were both bachelors too) emerged from a pub very late one night and full of drink, pulled on our boots and climbed Skiddaw in torrential rain. I remember feeling decidedly numb. We were back down for nine in the morning. I suppose that’s how accidents happen. It’s a wonder how any of us made it to adulthood. We must have been doing something right.